The space caters to those who want more privacy or need special accommodations. The University of California, Berkeley, has unveiled a spacious "universal" locker room for students who want more privacy or require special accommodations, including those who are transgender, non-binary, or have disabilities or body image issues. The 4,500-square-foot space at the campus's Recreational Sports Facility officially opened its doors to all students Wednesday. 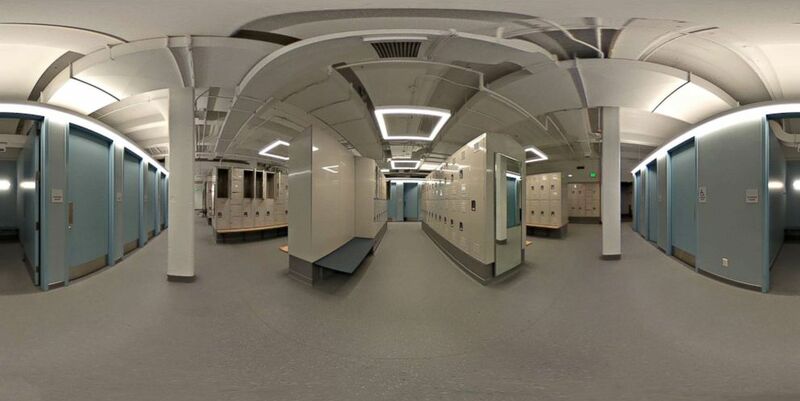 It's believed to be the first large-scale collegiate universal locker room in California and one of just a handful in the nation, according to a press release from UC Berkeley. The $2.7 million proposal to create a universal locker room was approved and announced in March 2017, and construction began that December. The new facility boasts its own entrance, 406 lockers, 16 individual changing rooms, seven private showers, five private toilets and four shared sinks -- all of which have or include disability accessibility. The space also leads to the pool, which was once only accessible through the existing men's and women's locker rooms. "We'd heard from some students who were uncomfortable, we knew there were more, and we spoke with colleagues who work with those populations," Brigitte Lossing, UC Berkeley's interim associate director for recreational sports, said in a statement Tuesday released by the school's Office of Communications and Public Affairs. "We're here to serve everyone." (UC Berkeley ) The University of California, Berkeley, created a 4,500-square-foot "universal" locker room for students who want more privacy or require special accommodations, including those who are transgender, non-binary, or have disabilities or body image issues. School officials hope the new locker room will help those seeking additional privacy feel safe, comfortable and welcome. That includes trans and non-gender binary students, students with physical disabilities as well as students suffering from mental illness. Juniperangelica Cordova, a transgender student majoring in ethnic studies, said students like herself can't fully partake in college life if there are places on campus where they're afraid of being stared at or harassed. Prior to the opening of the universal locker room, Cordova said she would get anxious whenever she considered working out at the campus gym. "I like to work out, but I'd often avoid the locker room and go home with dirty clothes, or not go to the gym at all," Cordova said in a statement Tuesday released by the school's Office of Communications and Public Affairs. 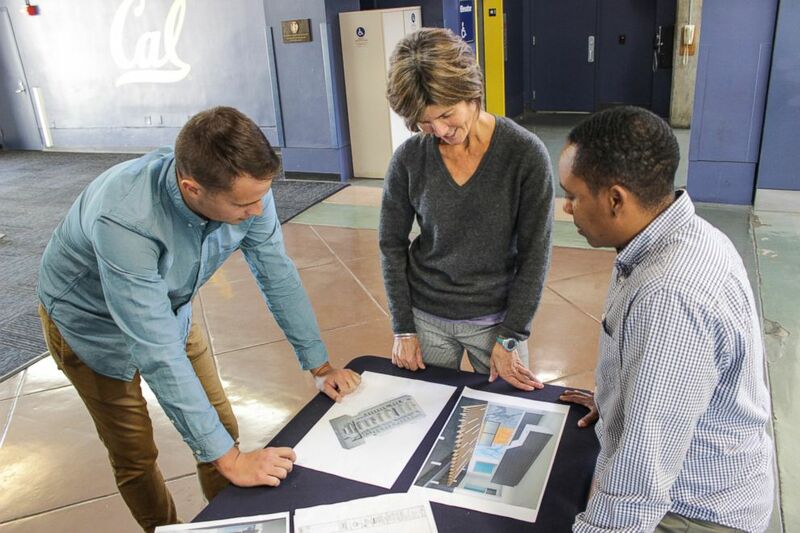 (UC Berkeley ) Left to right, Will Morrow, former ASUC President, Trineice Durst, former Associate Director of Rec Sports and Brigitte Lossing, Interim Associate Director of Rec Sports of UC Berkeley look over plans for the new lockerroom. Ben Perez, manager of UC Berkeley's Campus Access Services, has used wheelchairs since suffering a spinal cord injury when he was 16. He said he remembers being a new student in 2007 and feeling "mortified" over having to share a residence hall bathroom and showers with dozens of other students. "My disability life had been a private thing," Perez said in a statement Tuesday released by the school's Office of Communications and Public Affairs. "My parents were involved, my two closest friends and my caretakers. I cannot tell you how mortified I was. I didn't want to look disabled at that time. I would have valued a little bit of space to learn how to be comfortable with myself." Perez said the new universal locker room "sets a tone" and marks an "especially important moment" for the school because it intentionally removes a barrier to make spaces more inclusive.